Another fake email has started making the rounds. 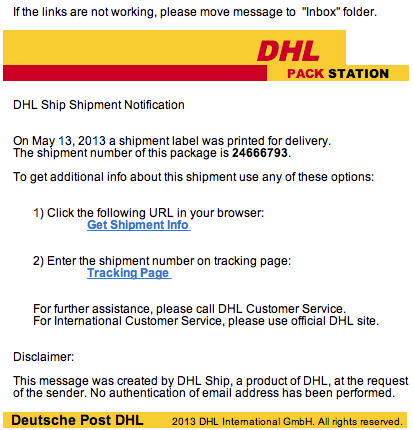 It’s a phishing scam disguised as originating from DHL — it is not from DHL. If the links are not working, please move message to “Inbox” folder. On May 13, 2013 a shipment label was printed for delivery. The shipment number of this package is 24666793. Deutsche Post DHL 2013 DHL International GmbH. All rights reserved.